Shrouded Grove is a grove with a small cave located in the Pale. It is located due south of Silverdrift Lair and west of Nightgate Inn, and is inhabited by leveled animals and spriggans. The grove's only identifying features are a large stone statue head and a few stone columns. There is a leveled spriggan camouflaged against a tree trunk to the left of the cave's entrance as well as a leveled animal in the grove nearby. There is also a frost troll in the vicinity that may attack the animal. The entrance leads into a short, ice-covered tunnel that leads into the cave itself. Upon entering, you will see two animals attacking each other; the winner will generally be quite injured by the encounter, making it an easy target. Camouflaged against a tree trunk to the left is another leveled spriggan. Once the enemies are dealt with, you are free to explore the rest of the cave. 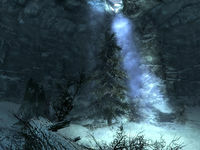 There is an unlocked chest against the east wall, by the back of the cave; to the left of it lie two dead draugr, and an open sarcophagus lies behind it on the right. The sarcophagus contains a third draugr and a copy of the Light Armor skill book Ice and Chitin. Shrouded Grove isn't marked as a cave, so cave-based radiant quests won't target it. This bug is fixed by version 1.3.3 of the Unofficial Skyrim Patch. This page was last modified on 24 March 2017, at 05:37.